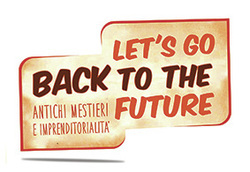 PROJECT "LET'S GO BACK TO THE FUTURE!" "Let's go back to the future!"! is an intercultural exchange took place in San Cesario di Lecce, which involved 30 young people from Cyprus, Greece, Italy, Portugal, Slovakia and Spain. The exchange was the follow-up of two projects already implemented by VulcanicaMente as "InterGenerations" and "Get up, stand up, be healthy guys! ", Focused on youth participation, entrepreneurship and creativity of young people aimed at promoting the intergenerational dialogue by creating a bridge between the different generations. Participants of the project were NEETS, young people who are not enrolled in school or college, who do not work and do not receive training or professional development ("Not in Education, Employment or Training ') and young people with fewer opportunities. The project provided an opportunity for participants to recover the ancient crafts, to strengthen their national identity, and raise awareness of European citizenship. The participants have discovered possible ways to transform the tradition in employment, reinventing the ancient crafts and offering experience to traditional professions related to crafts through study visits and the sharing of good business practices. Through workshops, presentations, meetings with artisans, the participants learned to go beyond the generation gap: the sharing and exchange of knowledge and different kinds of experiences.